Generate custom branded PDFs to send to your customers and embed our free SEO audit tools on your website. Simply upload your logo and company details. Generate unlimited reports to impress your sales prospects. Embed our widgets on your website to generate 10x more leads! Easy to install in WordPress thanks to our plugin. 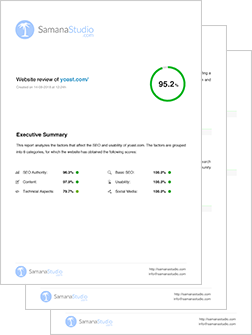 Each time a visitor uses your free SEO audit tool, you'll get an e-mail. Leads are also tracked in your dashboard. Your visitor will receive a fully customizable e-mail along with the requested report. If you work in the digital world, this tool is for you. Insert our tools on your website and start generating leads from today.